Yesterday Luke & I spent the afternoon together without Romy. It was the first bit of quality time we have had together in a long time and we had a really lovely day. After a restless night for everyone, we got up relatively early so we could go out to the shops to get some things for Romy. Rather than drag the little bear around the shops with us we dropped her off to my parents house so she could spend some time with her grandparents while they weren't at work today. As soon as we got to the shops, we quickly bought the things Romy needed so we could spend the rest of our trip looking at the things we usually wouldn't have the time to look at. 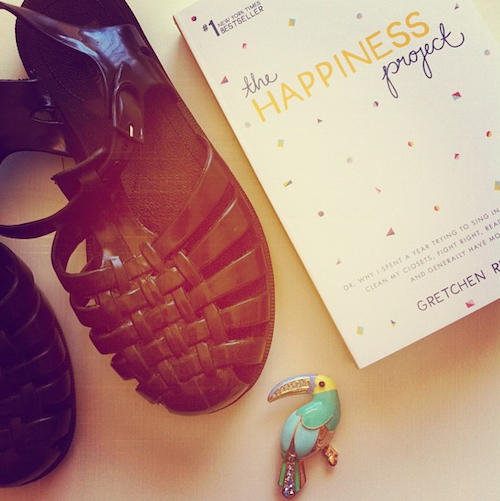 I bought some black jellies, a parrot brooch and next month's allocated read 'the happiness project'. Our day ended with an all night sleeping baby, season 1 of Aaahh!!! Real Monsters, whiskey & quinoa fattoush.